Mentha Piperita is a plant found in Europe, USA and the Middle East. It’s main constitutents is Menthol. It also contains other chemicals such as menthene, phellandrene, mentone, and limonene. 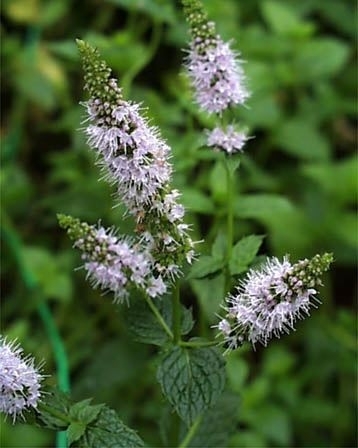 It’s best to use peppermint as a whole, rather than extract menthol from the plant, because the other consitutents make up the profile of the plant and can be as potent as menthol, but alone will not have the same effect. Peppermint oil is used in toothpaste and as food flavoring. The plant steeped in hot water is known in aiding digestion, however, caution should be taken when opting for peppermint tea. The oils in the plant relax the intestines and slow down digestion. Peppermint oil has an affinity to the stomach, liver and digestive tract, and it’s anti-spasmodic content are great for diahrrea, colic and vomiting. Used in diffusers, can assist with nasal decongestion and as an anti-bacterial agent to purify the air if there is a room full of individuals suffering from the flu, or are coughing. It’s used to reduce fevers if a couple of drops in 30ml of olive oil/almond/grapeseed oil and applied on the individual’s skin. It’s also great to relieve headaches. Peppermint is a great muscle relaxant if mixed in a vegetable oil and applied in a massage session. Insects, rats and ants are dterred by the strong scent of peppermint. Also used as disinfectant, if counters or table tops are washed down with peppermint oil infused in distilled water and sprinkled on a surface. Individuals on homoepathic remedies should not be using peppermint oil, nor store their remedies in the same cabinet as the oil. Peppermint oil must be used with discretion and must be mixed at 1% dilution. Oils must never be substituted for medical advice or medications. Please consult your health care practitioner.